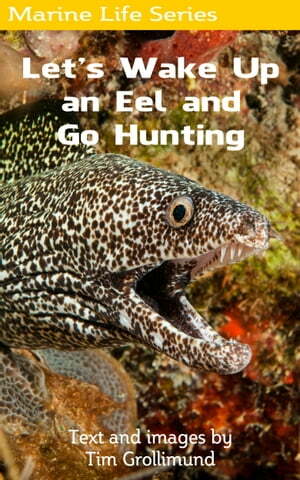 Collins Booksellers - Let's Wake Up an Eel and Go Hunting by Tim Grollimund, 9781370952335. Buy this book online. "While the vast majority of observations during the day are while eels are resting or on a cleaning station, a few times I have seen an eel coupled with a grouper. The first time I saw this was on the Winch Hole. A graysby came to a stop on a pile of rubble, and a goldentail came out from its lair. At first they just sort of looked at each other, then came cheek to cheek, touched, and took off together. I have seen it a couple of other times with a green moray and black grouper. This behavior has not been greatly documented according to the research I did this week. I could only find a few scientific references based on cooperation and communication between different fish species. Other cooperative hunting behaviors among single species are well documented - from dolphins to chimpanzees - but inter-species communication coupled with cooperative behavior studies among fish are rare. There are many relationships of joint foraging, such as wrasses hanging out with trunkfish. These involve a nuclear species (the main dude) and a follower (the one cleaning up the scraps). What differentiates the grouper/eel behavior is the grouper seeks the eel and communicates its intention to hunt with a specific signal.